“The Laodicean message applies to the people of God who believe present truth.” – Testimonies, vol. 4, p. 87. The seven churches of the Revelation do not represent simply seven historical, local churches in Asia Minor which received their names from the towns in which they were located. We believe that these letters to the seven churches are applicable to seven great periods in the history of the Christian church, beginning with the apostolic church and preceding through the church that will stand ready when Christ returns. The last period, called Laodicea, is, as the name indicates, destined to be a time of judgment. The name Laodicea is made up of two Greek words: Laos, which means people, and Dike, which means judgment, justice, punishment, or vengeance. We may combine these two concepts in different ways but cannot escape the conclusion that the message to this church applies to the people who live in this special time of the judgment. 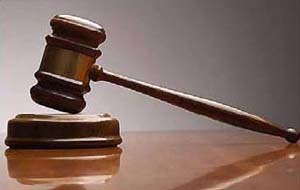 We, as Seventh-day Adventists, believe that this time of the investigative judgment began in 1844. It is evident from the Writer’s introduction that this letter is addressed to the church living in the last time. Christ calls Himself the Amen (so be it), an expression of confirmation commonly used at the conclusion of a prayer. Then He uses the name, the Faithful and True Witness. That He has a right to call Himself by this name is made abundantly clear in the fulfillment of the prophetic utterances in the foregoing letters to the churches. He also takes the name, the Beginning of the Creation of God. He is the One who created all things; He saw everything before it even was, and now with this impeccable authority He presents Himself to the last church. Surely His testimony is reliable! In almost every letter sent to the seven churches we find reproof and warning. This last church is no exception: “I know thy works, that thou art neither cold nor hot: I would thou wert cold or hot.” Revelation 3:15. This statement expresses most eloquently the condition of all-pervading indifference and lukewarmness that is characteristic not only of our present age in general, but specifically of the professing people of God in this modern world. COLD indicates an emotional state of feeling destitute, poor, unfit, uncomfortable, and sorely lacking in spiritual value. Christ says, “I wish you were either cold…” only because it is a much preferable condition than being lukewarm, for when the quickening spirit of God reaches the depths of his soul, he may come to life and become hot. HOT, then, must indicate the opposite of cold. It denotes a fervent zeal and great love for God, including corresponding works. It is no wonder that Christ wants His people to be either cold or hot. However, the statement continues rather sadly: “So then because thou art lukewarm, and neither cold nor hot, I will spue thee out of My mouth.” Rev. 3:16. To those who lived in the ancient city of Laodicea, this symbol of lukewarmness was a most descriptive phrase. Approximately 6 miles from the town there was a hot spring and waterfall at Hierapolis; but as the water from this spring flowed through the Lycus valley, it inevitably cooled off; and by the time it reached Laodicea it was only lukewarm, unfit for any real use, and least of all for drinking. It is true, indeed, that if there was any people that could pride itself in regard to spiritual privilege or light bestowed on them, it would be the Seventh-day Adventist Church. This light was given to them so that they would follow it, walk in it, and share it with others. However, when this people boast of their prosperity and popularity, of property and numbers, they reveal a serious lack of humility. In doing this they become spiritual bigots who are immorally proud of their wealth and status. “Let a church become proud and boastful, not depending on God, not exalting His power, and that church will surely be left by the Lord, to be brought down to the ground. Let a people glory in wealth, intellect, knowledge, or in anything but Christ, and they soon will be brought to confusion.” – Testimonies, vol. 8, p. 127. There is also an evident pride on the part of Seventh-day Adventists and their leaders in the great work they are doing. Their many churches, their schools and universities, their hospitals and publishing houses, and the growth in membership are all sources of pride to them. Statistics play an increasingly important role in the denominational life. In this letter the True and Faithful Witness unmistakably pointed out that this is a characteristic of this people. Obviously this statement contradicts the testimony of Christ in the letter to the Laodiceans. “What greater deception can come upon human minds than a confidence that they are right when they are all wrong! The message of the True Witness finds the people of God in a sad deception, yet honest in that deception. They know not that their condition is deplorable in the sight of God. While those addressed are flattering themselves that they are in an exalted spiritual condition, the message of the True Witness breaks their security by the startling denunciation of their true condition of spiritual blindness, poverty, and wretchedness. The testimony, so cutting and severe, cannot be a mistake, for it is the True Witness who speaks, and His testimony must be correct.” – Testimonies, vol. 3, pp. 252,253. “I have been shown that the greatest reason why the people of God are now found in this state of spiritual blindness is that they will not receive correction. Many have despised the reproofs and warnings given them.” – Testimonies, vol. 3, p. 255. Here is brought to view Christ’s threefold offer of mercy, an offer that would remedy all the ills of the church. GOLD. A symbol of faith – faith that works by love (Gal. 5:6). God’s true people are rich in faith (James 2:5). Faith tried in the furnace of affliction is compared with gold (1 Peter 1:7). RAIMENT. A symbol of character. The Faithful Witness had already stated that they were naked and thus in dire need of clothing. Here He offers His own beautiful and pure character to them, so that they may be clothed in His righteousness (Gal. 3:27). As an interesting historical note, we find that the ancient city of Laodicea was famous for its black woolen cloth. It must have presented a striking contrast to them to hear this word of God, that they were in need of white raiment, the very opposite of their own glory and fame. EYESALVE. A symbol of enlightenment by God’s Holy Spirit. Since the church has been pronounced blind, they need a remedy to restore their eyesight. In John 16:13,14, we read that the Holy Spirit was promised to the disciples as their Guide, Revelator and Teacher. “The gold here recommended as having been tried in the fire is faith and love. . . . The white raiment is purity of character, the righteousness of Christ imparted to the sinner. . . . The eyesalve is that wisdom and grace which enables us to discern between the evil and the good, and to detect sin under any guise. God has given His church eyes which He requires them to anoint with wisdom, that they may see clearly; but many would put out the eyes of the church if they could;. . . The divine eyesalve will impart clearness to the understanding. Christ is the depositary of all graces. He says: “Buy of Me. '” – Testimonies, vol. 4, pp. 88,89. We understand the eyes of the church to be the Spirit of prophecy. Please read 1 Sam. 9:9. It will be evident to the observant student that the counsel of the Spirit of prophecy is indeed needed most earnestly by the church today. Rev. 3:19,20. God in His mercy does not reject anyone without giving him an opportunity to repent and change his ways. So also with His last people He provided many opportunities for them to repent and be restored to His grace. Yet God’s mercy is not limitless, something which appears to be very strange to many Adventists when it concerns their church. “God never forsakes people or individuals until they forsake Him.” – Selected Messages, Book 2, p. 378. Rev. 3:20 states that Christ stands at the door. Christ is represented as standing at the door of our hearts, asking to be admitted, longing for entry. However, He will not stand there forever. The remarks made in the SDA Bible Commentary on this verse convey a different, more soothing picture: “The form of the Greek verb implies that Christ has taken His stand at the door and remains there. He never tires of offering His blessed presence to all who will receive Him. . . .” We believe that this is not a true representation, because the time of grace will one day definitely end forever. “Our Redeemer sends His messengers to bear a testimony to His people. He says: ‘Behold, I stand at the door, and knock: if any man hear My voice, and open the door, I will come in to him, and will sup with him, and he with Me.’ Rev. 3:20. But many refuse to receive Him. The Holy Spirit waits to soften and subdue hearts; but they are not willing to open the door and let the Saviour in, for fear that He will require something of them. And so Jesus of Nazareth passes by. He longs to bestow on them the rich blessings of His grace, but they refuse to accept them. What a terrible thing it is to exclude Christ from His own temple! What a loss to the church!” – Testimonies, vol. 6, p. 262. In previous lessons we have shown that when the message of Christ and His righteousness was presented to the church and its angel (the leadership of the church) it was rejected. Today we interpret the angel of the church of Laodicea to be: The General Conference of Seventh-day Adventists, Silver Spring, Maryland, USA. When the message of righteousness by faith came to the church again, it was not accepted. The history of the Advent Movement shows that this came true exactly as prophesied (we shall come back to this point in the next lesson). Since the gracious offer from heaven was not received in 1888 at the eventful conference in Minneapolis, the message was given to the people again, but in a different form. Instead of a peaceful message, it now came in the form of a severe crisis which demanded a decision. Rev. 3:20. We point you here to the significant change of address in the letter. Remember that the letter originally addressed the angel of the church, which is the collective leadership of the church. The Saviour, however, foresaw that the leaders would not accept the message; only individuals here and there would be willing to open the door and receive the truth of Christ into their hearts. The history of the Reform Movement and her bitter experiences during the test of faithfulness also fulfilled this detail of the prophecy. It was not the leaders or the ministers, but mainly the laymembers and humble ones, the sincere Advent believers, who accepted the offer of Christ. “I say then, Hath God cast away His people? God forbid. . . . Even so then at this present time also there is a remnant according to the election of grace.” Rom. 11:1,5. God will not end His work without a people that is called by His Name. “But the true faith was not to become extinct. God has ever preserved a remnant to serve Him.” – Patriarchs and Prophets, p. 125. “Let all be careful not to make an outcry against the only people who are fulfilling the description given of the remnant people who keep the commandments of God and have the faith in Jesus, who are exalting the standard of righteousness in these last days. “God has a distinct people, a church on earth, second to none, but superior to all in their facilities to teach the truth, to vindicate the law of God.” – Testimonies to Ministers, pp. 57,58. The membership of the Seventh-day Adventist Church grew from the time of its organization in 1863 through 1970 from 3,500 to 2 million members. By 2000 the church boasted of over 11 million members. The time periods in which the membership rose dramatically was after World War I when the 144,000 mark was reached. Immediately after 1918, when this War ended, there was a significant rise. And again after World War II, which ended in 1945, there was an even more significant increase in membership. 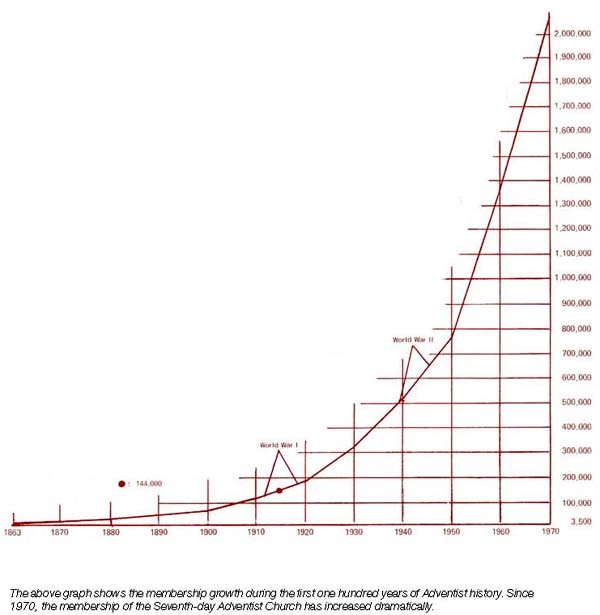 These jumps coincide with the spiritual apostasy and, we believe, were a direct result of it. “To lower the standard in order to secure popularity and an increase of numbers, and then to make this increase a cause of rejoicing, show great blindness. If numbers were an evidence of success, Satan might claim the pre-eminence; for in this world his followers are largely in the majority.” – Testimonies, vol. 6, p. 143. “The spirit which actuated those priests and rulers is still manifested by many who make a high profession of piety. They refuse to examine the testimony of the Scriptures concerning the special truths for this time. They point to their own numbers, wealth, and popularity, and look with contempt upon the advocates of truth as few, poor, and unpopular, having a faith that separates them from the world.” – Great Controversy, p. 596. “A congregation may be the poorest in the land. It may be without the attraction of any outward show; but if the members posses the principles of the character of Christ, they will have His joy in their souls. Angels will unite with them in their worship. The praise and thanksgiving from grateful hearts will ascend to God as a sweet oblation.” – Christ’s Object Lessons, p. 298. 1. To whom does the Laodicean message specifically apply? 2. What do we consider the letters to the seven churches in Revelation to be? 3. What outstanding characteristic does Laodicea have? 4. What does the name of this last church signify? 5. Is the message contained in this letter reliable? 6. What does it mean to be "cold"? What does it mean to be "hot"? 7. What attitude cannot be accepted by the living God? 8. What three additional characteristics of the seventh church are outlined? 9. Does God immediately reject the church? 10. What do the following symbolize: Gold, White Rainment, Eyeslave? 11. Is there a limit to Christ's forbearance? 12. What does it mean to be spewed out? Is this a permanent condition? 13. 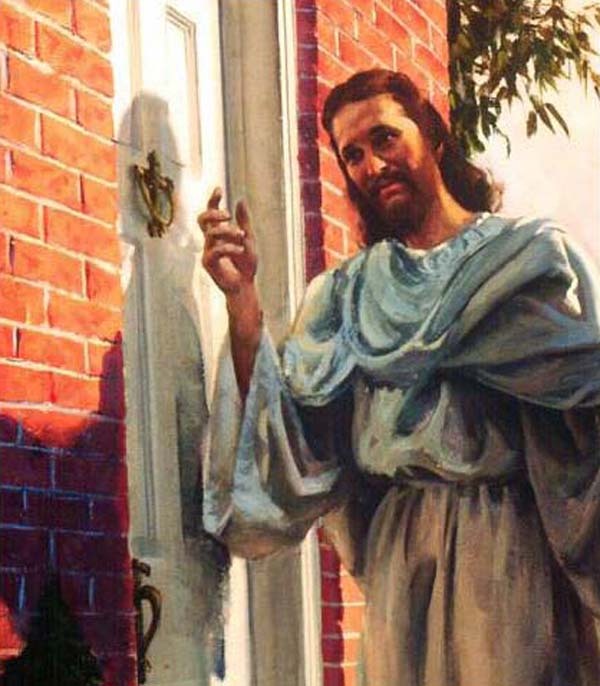 How is Christ's knocking at the heart's door carried out in reality? 14. What will come out of the last church, just as happened with all the previous churches?